What Do Cloud Computing Companies Offer? Make Easy Money Online Right Now! Trans-Fee Mining is the latest buzzword in the cryptocurrency world and you should be paying attention to it. First launched by Fcoin (not really, IQOption was the first to offer a token to cover commissions) the method involves cryptocurrency exchanges issuing their own tokens as a reward for trading. The tokens not only incentivize trading they provide an easy means of reducing the cost of trading: the tokens can be redeemed to cover the cost of commission or held until a later day. While some industry insiders criticize trans-fee mining it is clear the traders love it. Prior to the launch of Fcoin, Binance was the industry leader in terms of trading volume over a 24 hour period (about $1 billion). Since then two leading exchanges, Singapore based Coinbene and Hong Kong based Bit-Z have shot up in the rankings both topping the $1.5 billion/24hours mark. According to the Bit-Z whitepaper the exchange will issue 300 million in BZ tokens. The tokens will then be used to reimburse 100% of exchange fees paid in BTC or ETH. The Bit-Z program started this week while the Coinbene program has been live for about two weeks. One criticism is that traders could manipulate trading in order to receive the tokens. A trader using an automated bot could quickly buy, sell and re-buy a cryptocurrency suffering little to loss on the exchage rate and rack up not one, but three commissions worth of the new tokens. Another criticism is that the issuance of new tokens is, in effect, an initial coin offering that can be manipulated by the exchange. Regardless of the criticism the industry is taking notice. Another major exchange, this time located in China, is also considering the move. BigONE, a cryptocurrency exchange backed by crypto-mogul Li Xaolai, is reported to be considering the adoption of trans-fee mining. Wait, Trans-Fee Mining Isn’t New? What many in the industry fail to recognize is that trans-fee mining is not a new thing. IQOption is in fact the leader in this field having partnered with the OTN (open trading network) in an effort to revolutionize trading (and establish IQOption as the leader in block-chain based trading services). What is the OTN Network? The OTN Network is designed to be a one-stop full service block-chain based trading service. It (in conjuction with IQOption) will feature wallet, exchange and trading services for the full array of cryptocurrencies and block-chain based trading for forex and other commonly traded assets. 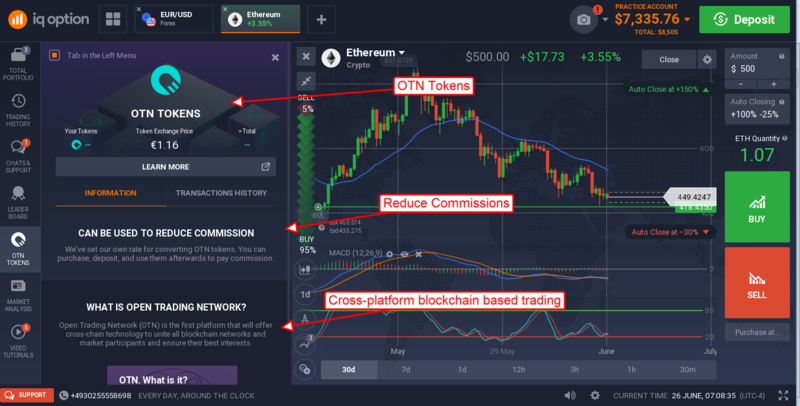 The OTN tokens, as part of the roll-out and launch of the platform, are being delivered to IQOption traders who trade cryptocurrency CFD’s on the IQOption platform. The tokens can be used to cover costs of trading, traded with other exchange members or held until a later date and sold for profits. Further, anyone holding OTN tokens will be rewarded with more tokens (to help incentivize liquidity) as the platform meets its timeline goals. Can Subliminal Messages Make Physical Changes in the Body? Binary Fest - Make Money Online Blog.